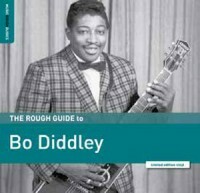 Bo Diddley’s driving and irresistible beats, which he likened to the sound of a freight train, inspired countless bands from the Rolling Stones to the Doors. With classic hits such as “Diddy Wah Diddy” and “Who Do You Love?”, Bo Diddley ranks alongside Elvis Presley and Chuck Berry as one of the truly great pioneers of rock ‘n’ roll. Compiled by renowned music journalist Nigel Williamson this Rough Guide includes his most legendary songs such as “Who Do You Love?”, “Road Runner”, “Pretty Thing” and “Say Man”. Bo Diddley was inducted into the Rock and Roll Hall of Fame in 1987 and he was the first black artist to appear on The Ed Sullivan Show. He was ranked by Rolling Stone Magazine as number 20 in its list of “100 Greatest Artists”.